Sh. Sanjay Agarwal, Hon'ble Principal Secretary Power, Govt. 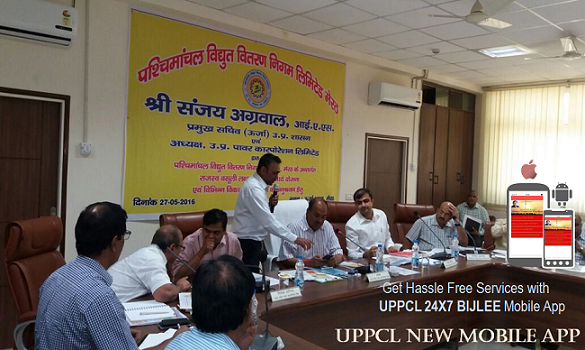 of UP and Chairman, UPPCL has recently launched UPPCL 24X7 BIJLEE mobile App to improve the customer services in the State of Uttar Pradesh. The consumers will now be well informed in advance about the power outages and immediate action will be taken against their complaint. UPPCL has taken an innovative step towards a hassle free and transparent system and it is powerful enough to bring about a great change in the power sector of India. App will empower the consumer to register complaints related to “No Power Supply”, Wrong Bill etc. without visiting UPPCL's office. App will further enable UPPCL's officers to give advance information about breakdown and shutdown to consumers.UPPCL has given a great opportunity to "Mobineers" to develop UPPCL 24X7 BIJLEE mobile app for consumers and its officers on AppSavy platform. The continuous guidance of Sh. Abhishek Prakash (IAS), Managing Director, PVVNL is the reason of success of this Mobile App. This application is for iOS & Android mobile phones. Consumers can download this App from the iTunes play store and from Google Play. The mobile application is freely available with customer centric features you can download on Android and iOS.